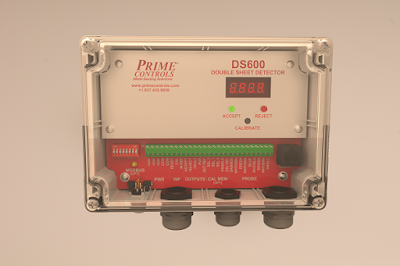 Specifically designed for non-ferrous metals, the DS600 is the newest addition to Prime Controls' Double Sheet Detection solutions. The DS600 system pairs with a non-contact, single-probe sensor making it ideal for automation and robotic applications where sensing from one side is possible. The DS600, when paired with a specific non-contact, single probe sensor, will detect non-ferrous metals (such as 300 Series Stainless Steel and Aluminum) with thicknesses ranging from .025mm to 3.81 mm. Housed in an IP65-rated enclosure, the DS600 unit is thoroughly protected in the typical shop floor environment. DS600 Premium - A hands-off product, offering eight-slot calibration memory, easily selected through discrete I/O, for quick change-overs with no re-calibrations required. This model also provides threshold adjustments and variable timing during the detection process for better gauging of metal thickness and more defined measurements. DS600 Premium Plus - With all the features of the DS600 Premium, the DS600 Premium Plus also offers additional memory, memory backup, and industrial communications capabilities to get the most out of the Double Sheet Detector. Join Jeff Rudy from Prime Controls for the "Metal Sensing - Double Sheet Detection" Webinar next Thursday, Oct. 13th. CLICK HERE, or call 800-228-2790, for more details.